The Lichfield Garrick follows its 2016 production of Howard Goodall’s The Hired Man by staging another Goodall-scored show, The Dreaming. This is the theatre’s second community musical and features a company of over 70, under the co-direction of the theatre’s artistic director Tim Ford and Craig Sanders. It’s a massive project which gives thrilling musical heft and scale to this evocatively English choral and folk flavoured rewrite of A Midsummer Night’s Dream. While librettist Charles Hart’s mapping of Shakespeare’s plot and characters is intricate and layered – it helps to have a working knowledge of the original to follow it fully – it also has its own sense of elegiac longing and piercing strangeness, as the spiritual world makes its own mischievous contributions to the follies of young human lovers. There are times when it feels like an English version of Into the Woods, as it sends its characters into parallel collisions in a wooded environment, presided over by supernatural forces. That atmosphere is stunningly caught by the gorgeous forest design of corrugated steel trees and small bright coloured balls, lit with sculptural beauty by Matt Clutterham. But it is the committed ensemble strength of the tightly-drilled cast that captures the overwhelming beauty of Goodall’s richly melodic score and makes it such a powerful community event. 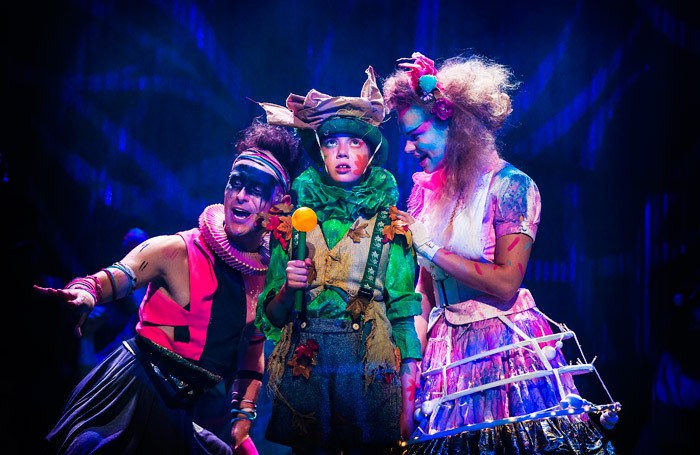 While some of the voices may be variable, there’s a particularly impressive vocal performance from Chris Gilbey-Smith as Angel – the Oberon-like leader of the boy-woodlanders – and the spry and touching 10-year-old Macie Barrington as Jack, the Puck character.